Michael Mmoh has accepted a wild card into the upcoming USTA Boys 18 Nationals in Kalamazoo, which begins on August 5th. Although Mmoh is currently 323 in the ATP rankings, sixth in the world among all boys 18-and-under, his chances for a main draw US Open wild card are slim, with Frances Tiafoe, Stefan Kozlov, Jared Donaldson, Tommy Paul, Ernesto Escobedo and Noah Rubin, all 20 or under, ahead of him in the ATP rankings. With only three discretionary wild cards remaining (Kalamazoo champion, NCAA champion, reciprocal wild cards with France and Australia, and the USTA Wild Card Challenge account for the other five), Mmoh's clearest path to his first major main draw is through Kalamazoo. A seventh wild card was not used, allowing the next player on the alternate list to get in. The eighth wild card will go to the winner of the USTA National Wild Card tournament in Arlington, Texas, which takes place in this weekend. North Carolina rising sophomore Anudeep Kodali is in the 16-player boys draw. Brandon Holt, who reached the round of 16 in singles and finished third in doubles last year, has withdrawn. Holt has been dealing with a back injury since the junior clay season in Europe. A complete list of players can be viewed at ustaboys.com. Four US men have advanced to the round of 16 at the ATP Masters Rogers Cup in Toronto, three of them outside the Top 100. 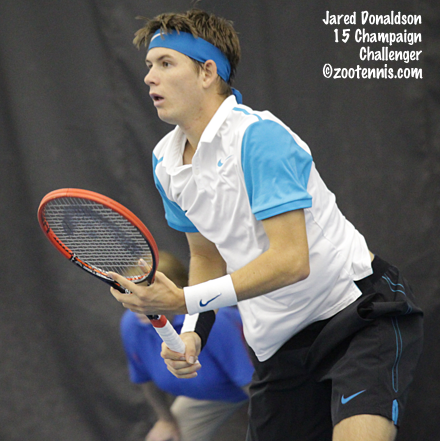 Qualifier Jared Donaldson picked up the biggest win of his young career in defeating No. 33 Fabio Fognini of Italy 6-3, 3-6, 6-3 and will play Wimbledon finalist Milos Raonic next. At age 32, Rajeev Ram has reached his first Masters round of 16 with a 6-4, 7-6(5) victory over No. 13 seed Lucas Pouille of France, and qualifier Ryan Harrison took out John Isner, seeded No. 9, 7-6(3), 6-7(4), 6-4. The fourth US player in the round of 16, and the only one inside the top 100 is No. 16 seed Jack Sock, who beat Donald Young 6-4, 6-3. Harrison's opponent is No. 5 seed Tomas Berdych and Sock plays No. 2 seed Stan Wawrinka. ATLANTA, GA July 25, 2016 – On March 16, 2016, the Tennis World lost one of its biggest supporters, Sol Schwartz. He was 46 years old. He was a husband, a father of two, a son, a brother, an uncle, a coach, a mentor, and a friend. Lisa Stone, creator of the ParentingAces website and radio show, had a short-lived but very meaningful friendship with Schwartz and published her tribute to him almost immediately after hearing of his passing. Her piece went viral, eventually making its way onto Huffington Post. But it was Schwartz’s commitment to improving the junior tennis tournament experience through the Holabird-adidas All-In Junior Tennis Challenge that provided the first opportunity for Stone to meet him in person. “ . . . when he picked us up at our hotel to take my son for a practice hit, it was like being picked up by an old friend. There was no awkwardness, no moment of hesitation, simply a connection that was already established because of our extensive phone calls and Facebook interactions. This man was genuine and good-hearted and took us into his city and into his home and made us an immediate part of his family,” explains Stone. When she started thinking about the best way to honor the memory of her friend, Stone came up with the idea of creating a junior tournament in the spirit of Schwartz’s 2012 Holabird event. She reached out to Sol’s friends and family and pulled together a hard-working committee consisting of Holabird owner David Schwartz, college tennis coach Robert Hubbard, tennis parent Melanie Rubin, and Randy Jenks of Universal Tennis Ratings. In addition to presenting sponsor Holabird Sports, the committee has secured sponsorships from Wilson Tennis, 10sBalls.com, Kassimir Physical Therapy, as well as several of Schwartz’s friends and family members. The Sol Schwartz #SaveCollegeTennis All-In Tournament presented by Holabird Sports, affectionately known as #TheSol, will be held August 20-21, 2016 at The Suburban Club in Pikesville, Maryland, a suburb of Schwartz’s hometown of Baltimore. It is open to all junior players – boys and girls - age 18 and under. Players will be able to receive coaching at the changeovers and will be guaranteed 4 matches under the format created by Universal Tennis. Unlike most junior tournaments where the winners receive a plastic trophy, winners of #TheSol will receive an incredible equipment and clothing prize package provided by Wilson Tennis. Click here to go to the tournament website for more details and to register to play. Good move by Mmoh to play Kalamazoo for all the reasons listed above, a lot of competition this year, a lot of guys ranked between 100-200. Risky move by Kozlov to skip K'zoo, because, he'd be the favorite to win K'zoo this year. But, he's not guaranteed a MD WC because there's Donaldson, Fratangelo, Tiafoe, and after this week, (Harrison and Novikov) ranked ahead of him. Plus, if Krueger's lead in the WC Challenge holds up, then he'll have to beat out one of those guys. Not to mention Rajeev Ram and Rubin. Maybe he's satisfied knowing he's already DA into qualies. The concept of the Pro Circuit US Open wildcard is great but it appears all someone has to do is win 1 of the 3 50K Tournaments, like Sofia Kenin did and she earns a Main Draw WC into a Grand Slam Tournament. She didn't even play the 1st Tournament. This seems like low success for such a big reward. Why can't they add some WTA events into the mix if players want to play those events instead? Jessica Pegula got to the Semi's of WTA Washington but that doesn't count? She beat Christina McHale & Sam Stosur. Look what Ryan Harrison has done and all the points he has accrued in the past several weeks but NONE of those points count for the Pro Circuit US Open wildcard? That seems ridiculous to play a tougher schedule, beat several Top 100 players but not have any of those points count. Colette, since you and the wonderful writers at tennisrecruiting.net work closely together, I was wondering if you could find out the answers to these recruiting questions that I have had for a while, and I bet others have had too. 1. I was told informally (and it could be wrong) that coaches use this method to show you that they are interested in your child. They can't yet legally (via NCAA rules) approach your child, so they let you know that they are interested by regularly viewing your child's record. Is that even true? Do a lot of them do that? 2. If that is so, why do some of them use their generic job title to view your child regularly, instead of letting you know what specific school they are from? E.g. it'll say "Woman's Coach, MWC". Why do they do this if they don't tell you who they are? Surely they aren't following your child's progress every week or so? Even I'd get bored with that, ha ha. If they are trying to tell you that they are interested, you have no idea which coach it is from the MWC conference. 3. Why about once a week, does it show that the exact same coaches have looked at my child, on the same day, regularly? They all did it on the same day? Hard to imagine. Do they pay tennisrecruiting.net an extra fee to show that they are interested & to tag the recruit regularly? So then tennisrecruiting.net has a certain day in the week that they show that they looked,or something? It can't be coincidence. A few days will go by without them all looking, and then one day THEY ALL look, and then nothing for about a week except a few miscellaneous ones, and then it shows that THEY ALL looked again. This happens again and again. I was just curious. It's no big deal either way, just kind of fun to know. Thanks for your help and keep up the great job. @Skipping a level. Well, WCs are also given to the K'zoo Champion, and the NCAA Champion. Those are also single events. This is also the way the WCs are determined for the French & Australian WCs. Players have a choice. Lastly, winning Challengers isnt easy. If it were, everyone would be doing it. It's no one's fault if the rest of the players have multiple weeks with early losses. The original WC Playoff was a one week invitational tournament with the winner getting the WC. This format opens it up to far more players, evidenced by Brian Baker, Alex Kuznetsov, and you could probably include Rubin, winning WCs. First, as to pricing for our premium service, the first year of Recruiting Advantage is $49.95, and renewals are $39.95. We also offer monthly subscriptions for $7.95. 1. I was told that coaches use TRN to indicate interest in players. They can't legally (via NCAA rules) approach your child, so they let you know that they are interested by regularly viewing your child's record. Is that even true? Do a lot of them do that? TRN tracks visits from players (i.e., accounts linked to players) to team pages and from coaches (i.e., accounts linked to college coaches) to player profiles. John Doe can then see what coaches have visited his player profile, and the coach of XYZ University can see what players have visited her team page. There are many coach views each day, and coaches will (obviously) be more likely to visit profiles of players they are interested in. We only have anecdotal data, but we have had a few coaches tell us they visit player profiles regularly to stand out on their list of coach visits. Note that this type of indirect interaction is legal - just like coaches can "Friend" or "Follow" a recruit (see the answer to Question 6 here). 2. If that is so, why do some of them use their generic job title to view your child regularly, instead of letting you know what specific school they are from? E.g. it sometimes says "Woman's Coach, MWC". Coaches primarily visit player profiles to gain information. Some of them don't want recruits to know who they are visiting. Also, while this kind of interaction is completely permissible under NCAA (and NAIA and JC) rules, some school compliance officers follow more strict interpretations and recommend that coaches remain anonymous. For this reason, we allow Coach Smith of XYZ University to decide whether to show up as "Jane Smith - XYZ University" or "Woman's Coach ABC Conference". 3. Why about once a week, does it show that the exact same coaches have looked at my child, on the same day, regularly? They all did it on the same day? Coach accounts allow for coaches to add players to "Watch Lists". They have easy access to players on their watch lists, and they can also sign up for events. For example, they can sign up to get notified when players have played in a new tournament ... or have a birthday ... or if their rankings go up ... etc. The TRN system generates notifications for coaches with these events when they happen, and when we generate a notification for John Doe, it will show up as a visit to John Doe when the coach views the notification. For girls, many notifications go out on Wednesdays when the new rankings come out. For boys, it is Tuesdays. (Tournament participation and ranking increase notifications go out on these days when the new rankings come out.) So there are many views on these days because the coaches get "poked" on those days. Thanks so much for the answers. That makes a lot of sense. I appreciate your time. One last question, please: Why aren't doubles results even listed/noted/given any credit anywhere on Tennisrecruiting.net? They are so vital for college. If I was a coach, I'd want to see them, rather than having to go over to the USTA rankings. I will answer as a parent of college players even though you asked TR. First, typically no one plays with the same partner - can't be consistent. Scoring formats are all over the place at tournaments, again, no consistency. Many kids bail on their doubles partners, with forfeits and walkovers making a joke of rankings. Bottom line is, that information isn't important as junior parents think. What you are saying, that doubles is so important in college - yes, it is true, but only to a degree. That point is often times crucial, however, coaches aren't looking for a kid that is only good at doubles, but not good at singles. He would rather take a great singles player and turn them into a great doubles player. A good singles player will catch their eye, one that has doubles skills on top of singles skills is golden. A good doubles player that can't play singles isn't gonna be seen. Kids can come out of college a doubles specialist, but going in as only a doubles specialist will severely limit options.